For 50 years, the character of Holly Golightly from Truman Capote’s Breakfast at Tiffany’s has delighted audiences with her heartbreaking charm and sleek couture fashion sense. To celebrate the 50th anniversary of one of the most stylish movies ever captured on film and its chic ingénue, Integrity Toys and Paramount have teamed together to bring you an exquisite fashion doll collection inspired by some of the top fan favorite designs created by Hubert de Givenchy for the movie. Still modern today, these timeless creations have left an indelible legacy on our culture, defining “style” for an entire generation. Through this amazing collection, you’ll once again be under the alluring spell of that madcap, carefree New York girl known as Holly Golightly! Each vinyl doll in this ultra limited edition line features our fully articulated, small bust fashion doll body with a newly developed “Kitten Heel” foot, movie scene specific fully rooted hairstyle, applied eyelashes and a certificate of authenticity! The doll is approximately 12″ tall. 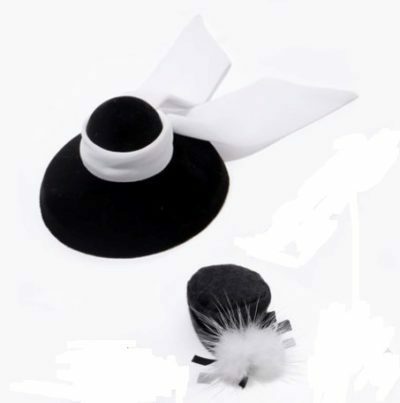 Dolls cannot stand-alone and may require hand support; doll stand included with each doll. From the opening strain of Henry Mancini and Johnny Mercer’s haunting, Oscar – winning song “Moon River”, you will fall in love with the characters of Holly Golightly, the carefree New York playgirl and Paul Varjak, the struggling and “sponsored” young writer! In this 24-carat romantic comedy based on Truman Capote’s best-selling novella, Paul finds himself swept into Holly’s dizzying, delightfully unstructured lifestyle, as she determinedly scours Manhattan for a suitable millionaire to marry. Winner of two Oscars, Breakfast at Tiffany’s is the romantic comedy that sparkles like diamonds! Third in the series of commemorative souvenir collectible dolls based on Breakfast at Tiffany’s, this wonderful addition to the collection is truly a classic from one of the most beloved scenes from this iconic movie! Upon learning that her new friend, writer and kept man Paul Varjak has never stolen anything from a Five and Ten discount store, Holly dares him to try it. Because, as she puts it, “We should all try something new!” What follows is one of the most memorable scenes from the movie where Holly and Paul end up stealing cat and dog Halloween masks, only to later end up at Tiffany’s to have “something engraved”. 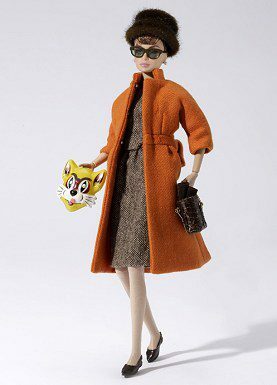 This 12-inch fully articulated vinyl dressed doll with rooted hair and applied eyelashes includes a daytime dress, sophisticated wool overcoat, fur hat, earrings, brown ¾ gloves, purse, sunglasses, shoes, cat mask accessory, doll stand and certificate of authenticity. Limited Edition of 350 Dolls Worldwide.